I’m just getting back from Philadelphia’s Justice for Trayvon Martin Day of Action, and the rallying cries of the march rang throughout the city. As we walked down Market Street from Love Park, the unified voices echoed off the buildings and reminded all we still seek Justice for Trayvon and all the unacknowledged people who have died due to the entrenchment of white supremacy. Our shouts mingled with actions across the country and demonstrate the movement for racial justice (and beyond) will continue to grow as long as oppression reigns. While not surprising, the verdict in the Zimmerman trial reminds us how firmly ingrained racism is within our “justice” system. So if you’re looking to build a terribly marginalizing system, then the Zimmerman trial is a good place to look for inspiration. While the George Zimmerman trial is just a single example of how our “justice” system upholds white supremacy every day, the case shows that those continuing injustice have some key practices at their disposal. So here’s how the Zimmerman trial illustrates how to build an (in)justice system. If you want to keep ensuring those with social benefits from their identity, then the legal system is your ally. By attacking Martin’s character and saying he planned on attacking (e.g. by saying he “armed himself with concrete”), the defense team made sure to find ways to keep the image of the “violent, black male” as the dominant one for the jurors. But obviously the prosecution team could expose the apparent racism right? After the judge decided the prosecution couldn’t use race as a factor in the case, it left key (or “the key”) elements out of the argument for Zimmerman’s guilt. As soon as you say race is a “non-issue,” then you automatically know there’s an issue. The judge’s decision is part of a larger trend, even extending to the Supreme Court, of disregarding issues of blatant racism. While Zimmerman was not rich himself, the hundreds of thousands donated to him helped make up for part of this difference. This shows that if you have the power of racist laws and some financial backing, then its going be much easier for you to succeed whether you are on the defense or the prosecution. While having a near all-white jury certainly helped protect the racist “Stand Your Ground” laws in this one case, as long as the dominant institutions, cultures, media, etc. remain so too will the ideology of white supremacy remain. As the first point I wrote about, these and other laws keep protecting the privileged and disregard any facts that could expose whiteness. By glossing over Zimmerman’s aggressive attitude to take matters into his own hands and ignore the 9-1-1 dispatcher (who said he shouldn’t follow Trayvon), the role of “macho” culture remained hidden. These are challenging discussions, but by not even having them presented in the case, their hidden role continues. We have work to do. If you care #HoodiesUp and work to end racial profiling. 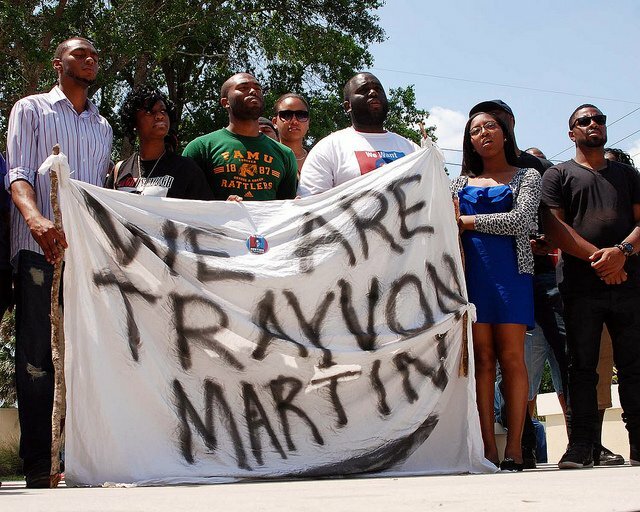 It doesn’t stop here honor #Trayvon. Judith Browne Dianis, Co-Director of the Advancement Project, reminds us that we must continue to expose this system based on racism and fear, but at the same time we must honor Trayvon’s life. In Philadelphia and across the country, the marches demonstrate this commitment. Follow Judith Browne Dianis on Twitter to keep up-to-date with her calls for racial justice.